Scottrade is a strong candidate for beginner investors who want more than online-only service. The company has one of the largest branch networks in the industry — roughly 500 offices across the country — and offers nearly round-the-clock phone and online chat support staffed by more than 1,000 investment consultants seven days a week. Other pluses are Scottrade’s $0 minimum balance requirement for individual retirement accounts, robust lineup of more than 2,600 no-transaction-fee mutual funds and beginner-friendly online trading platform. Back to those branch offices: It’s not just customers who appreciate the company’s dominant brick-and-mortar presence. Last year, TD Ameritrade announced it was acquiring Scottrade in a deal set to close in September 2017. After that, the two brokerages will merge services and offices under the TD Ameritrade name. Low costs: Scottrade’s $6.95 trade commission on stocks and exchange-trade funds is in line with TD Ameritrade ($6.95) and E-Trade ($6.95, though volume discounts are available). Last June, the company lowered its per-contract fee on options to 70 cents from $1.25. Along with a partnership with Interactive Brokers, this made Scottrade a player in the options trading arena. The brokerage’s mutual fund commissions are also low: It costs just $17 to buy and sell no-load funds and $0 to buy and $17 to sell funds that charge a sales load. Scottrade offers more than 2,600 no-transaction-fee mutual funds, so it’s easy to avoid paying a commission. Scottrade’s fee-friendliness extends to account fees; there are no inactivity or annual account service charges. Other freebies include branch appointments, portfolio review services and real-time streaming quotes and charts for nonprofessionals. Customer service: At Scottrade’s large network of 500 branches, customers can speak with investment advisors and attend investor-education events. Customers who call during normal business hours are routed automatically to their local branch. After the merger, Scottrade and TD Ameritrade offices will serve both brokers’ customers, potentially bringing the total number of combined branches to 600. Trade platforms and tools: Scottrade has multiple trading platforms designed for investors across the experience spectrum. The Scottrade client website, available in English and Chinese, is the on-ramp platform for new investors and provides the right amount of market data, research and basic screening tools to get the job done. Scottrade SmartText translates technical indicators on charts and screeners into plain English and provides context for investors. The platform also includes Scottrade’s portfolio review tool, powered by Morningstar, which gives clients asset-allocation guidance, identifies imbalances in their current portfolios and provides investment ideas to fill the gaps. 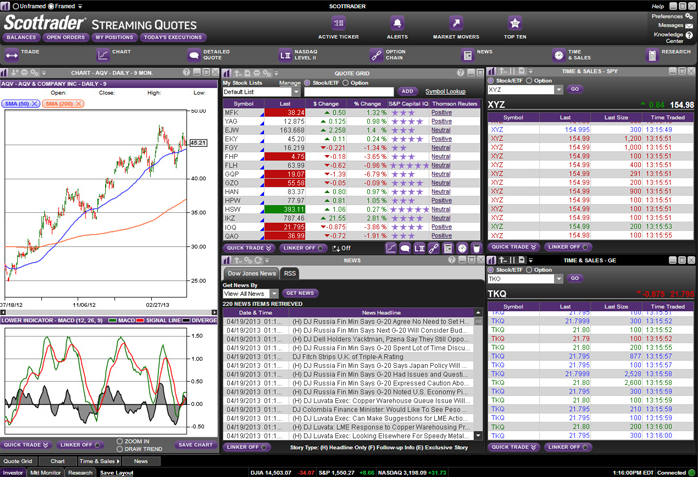 The Scottrader Streaming Quotes desktop platform is a step up in from the website in functionality. Here, investors have access to advanced charting with 30 technical indicators, advanced order entry with provisional trade commands, watch lists, real-time news from Dow Jones and, as the name implies, streaming quotes. Real-time streaming quotes and charts are free for nonprofessionals. Customers who make 10 or more commission trades per month also get free Level II quotes, which provide real-time bid/ask prices from retail and institutional market participants. A $10 a month subscription fee applies for investors who make fewer trades. Investors can trade options on any of the broker’s platforms, but the ScottradePro web, desktop and mobile platforms are specifically designed for options traders. They’re the result of a 2016 partnership with Interactive Brokers, which gives Scottrade customers access to multileg option trading, enhanced analytics and risk management tools. There’s a $5,000 minimum equity balance requirement to set up a ScottradePro account, but users pay less for equity trades (0.5 cent per share with a $5 minimum) and options contracts (50 cents per contract; $5 minimum). The broker’s team of advanced trading specialists, Scottrade Active Trader Group, is on call to answer questions and discuss strategies with clients. ScottradeElite, a program for Windows desktops and Macs that have a Windows emulator, is a souped-up version of Scottrader with even more robust screeners and technical indicators for active traders. Investors can get daily trading ideas from Recognia and independent research from Morningstar, Zacks, Learning Markets, New Constructs and more. This platform is truly aimed at the active trader and is available only to customers with primary account balances of $25,000 or more who have placed nine or more trades within the past three months. Limited investment selection: Scottrade’s lack of commission-free ETFs isn’t unusual for an online broker, but it’s worth pointing out because those are a popular vehicle for beginner investors and IRA investors. The company also doesn’t offer futures or forex trading — at least, not yet. TD Ameritrade offers both — and rates highly in our reviews of brokers for futures and forex trading — which means these investments will be available to Scottrade customers after the merger. Access to ScottradeElite: It’s not uncommon for brokers to charge customers more to access their advanced trading platforms. But Scottrade’s hurdle to use ScottradeElite is pretty high: Customers must have a minimum $25,000 balance and have placed nine or more trades in the past 90 days. (ScottradePro’s $5,000 minimum is also on the high side.) Investors who want a professional-level trading platform and can’t meet Scottrade’s minimums might prefer TD Ameritrade, although they’ll pay more in trading commissions. Post-merger questions: The TD Ameritrade acquisition of Scottrade isn’t scheduled to close until September 2017, subject to regulatory approval. So at least until then — and until the businesses are integrated — Scottrade’s terms, conditions, services and prices stand. However, Scottrade accounts will be converted to TD Ameritrade accounts at some point, and terms such as trading costs could change. The upside current and potential Scottrade customers is that they’ll gain access to more investments, TD Ameritrade’s multiple trading platforms and deep library of investment research and portfolio management tools. Scottrade offers the kind of hand-holding that beginner investors need to get started, including a breadth of educational resources, in-person support and free investor seminars. Its research offerings make it appealing to more advanced traders, as well. First-time investors, including those opening an IRA or starting to buy stocks, will find a comfortable home at Scottrade. Its range of trading platforms and online and offline customer-support network makes it ideal for investors who need a bit of guidance. Given the philosophical similarities to TD Ameritrade, those pluses will likely remain and even grow stronger after the acquisition is completed. Advanced investors will benefit in the future from access to wider investment options and TD Ameritrade’s superior thinkorswim platform. Both brokers have a $0 account minimum for IRAs, but if you’re hoping to set up a regular, taxable brokerage account, you may want to start at TD Ameritrade, where the minimum is $0 versus Scottrade’s $2,500. Updated March 3, 2017 .